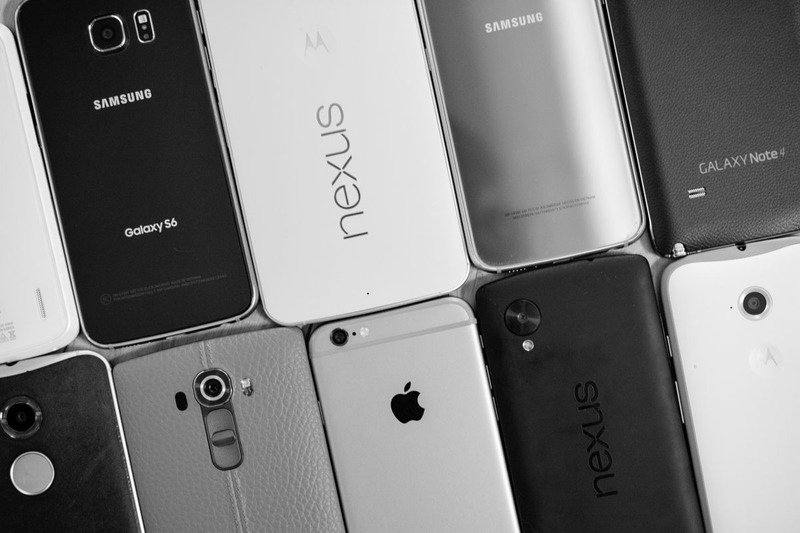 We get asked often to breakdown the costs associated with each major US wireless carrier in some form of a comparison. The task is not exactly simple, since each carrier uses its own tricks, sets of fees, data packages, and random charges to come up with a monthly bill that pads their pocket. It’s not all that straight forward, which is probably exactly how the carriers prefer it to be. They probably don’t want someone like us (or you) finding ways to quickly compare their plans to the competition and then making an educated decision on which is the best for you. Still, we gave it a shot. Well, we at least tried to break it all down into a simple comparison, one that is going to include more asterisks than you will probably know what to do with. Below, we have an image with two sections that attempts to tackle two different scenarios. The first is a carrier comparison of the cost of a single line if a person were to buy the Samsung Galaxy S6 32GB through each carrier’s monthly payment plan and sign-up for 3GB of data. The other includes the cost associated with 4 lines, that same Galaxy S6 32GB on a monthly payment plan, and a 10-12GB data plan. Take a look, then let’s talk about what we are seeing. PHONE PAYMENT PLANS: In each (both single line and 4-line) comparison, we went with each carrier’s 24-month payment plan. Verizon’s is EDGE, AT&T’s is AT&T Next 18, T-Mobile’s is just a 24-month payment plan, and Sprint’s is a 24-month lease (it’s the only option). We didn’t go with a 2-year contract in any situation because carriers seem to be moving away from 2-year contracts. INSURANCE: For each, we took the price of each carrier’s similar insurance and equipment protection plan that includes coverage for theft, loss, and damage. Obviously, depending on your needs for insurance, this price could vary per carrier. 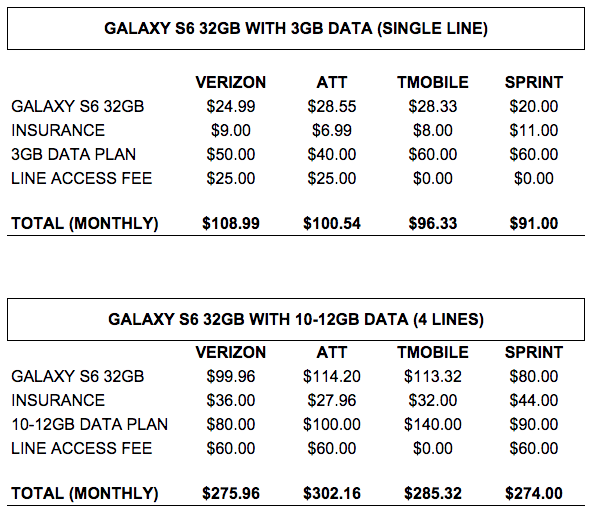 SINGLE LINE DATA PLANS: We used pricing from Verizon’s MORE Everything, AT&T’s Mobile Share Value, T-Mobile’s Simple Choice, and Sprint’s All-In (single line). In the single line comparison, understand that T-Mobile’s is technically a 3GB “unlimited” data plan that still allows you to access data after using up 3GB of 4G LTE data, it’s just severely throttled. Sprint, on the other hand, doesn’t offer a 3GB plan. They only offer their new All-In plan for single-line customers, which is technically “unlimited” with some pretty serious throttling limitations depending on where, when, and how you are consuming data. 4-LINE DATA PLANS: We used pricing from Verizon’s MORE Everything, AT&T’s Mobile Share Value, T-Mobile’s Simple Choice, and Sprint’s Shared Data Plan. Verizon and AT&T both offer 10GB plans that act as data buckets, while Sprint only has 8GB, 12GB, or 20GB buckets. T-Mobile doesn’t do data buckets, so their family plan with 3GB per line (to get to 12GB) is what we went with. Keep in mind that they are currently running a limited time deal for 4 lines and 10GB per line at just $120. This plan could stick, but since it’s technically a limited time deal, we didn’t use it in this example. LINE ACCESS FEE: All carriers except for T-Mobile charge customers a line access fee for each smartphone that is activated. Depending on the amount of data you choose, your line access fee changes. The more data you pay for, the lower your access fee can be. Also, you get a line access discount when signing up for a payment plan. In the single line example, Verizon and AT&T end up charging you $25 per line, while Sprint and T-Mobile don’t have single-line access fees. In the 4-line example, AT&T and Verizon access fees drop to $15 per line, while Sprint adds one that is also $15 per line. OTHER FEES: We gave you the most basic breakdown in the image above, so keep in mind that there could be all sorts of additional charges depending on your priorities or the carrier. All carriers: We obviously didn’t include regular fees that could be included with your monthly bill. AT&T: Starting August 1, is going to start charging a $15 activation fee with AT&T Next, which would drive up the cost upfront when buying a new phone, especially in the case of a 4-line plan. T-Mobile: T-Mobile (at least online) charges you for $15 SIM Starter Kits when signing up for new service ($60 for 4 lines). If you want to upgrade often and don’t go with T-Mobile’s lease program (JUMP! On Demand), you have to pay $10 per month for JUMP!, which allows you to upgrade more quickly. Keep in mind that JUMP! includes equipment protection, so if you remove the insurance price above and swap it for JUMP!, you are only looking at a $2 difference per month. Sprint: Sprint charges you a $36 per device activation fee, which is kind of insane, even if on their lease program. If you want to upgrade early, they also charge you $10 per month, similarly to how T-Mobile does with JUMP!, although, Sprint still charges you separately for insurance. When you start adding up activation fees and insurance plus upgrade monthly fees, Sprint becomes the king of nickel-and-diming. PROMOS: Carriers tweak pricing and options all of the time, so we went with what seem to be their standard options at this time that aren’t here temporarily. Verizon: Verizon’s 10GB for $80 plan seems to come and go, but this last time, it seems to have stuck around longer than usual. With that said, they could kill it again for another few months. T-Mobile: This was mentioned above, but as of today, T-Mobile’s $120 family plan that includes unlimited talk and text, along with 10GB per line for 4 lines is the best deal. But again, it’s potentially only here for a limited time, so we couldn’t use it for our example. Sprint: Sprint has been running a 20GB of shared data for $100 for a while now. In our example, we tried to keep this all close by going with a 12GB plan, but clearly the extra $10 spent to get into 20GB is the way someone should go. This simple comparison doesn’t cover every single scenario, because as I mentioned in the opening, all of these carriers do things a bit differently. This was an attempt to grab similar plans from each and then show you how they match-up in the simplest of terms. You could add on services or protection plans or upgrade plans or sign contracts or bring your own phone and this would all change. Some carriers also have benefits over others that they don’t charge you for, like T-Mobile’s free usage in Mexico and Canada. So again, this wasn’t meant to cover it all – it was a starting point to hopefully get you thinking and comparing on your own. With that said, as you may have guessed, Sprint is almost always the cheapest on a base level. That’s largely in part because of their wonky lease deals and attempts at grabbing your attention while the rest of the industry continues to reel in customers. T-Mobile is close behind them in terms of pricing, mostly because of promo deals like their new family plan. Overall, though, if you want to access the two best networks – Verizon or AT&T – you are going to pay more. That shouldn’t shock anyone. Verizon and AT&T can be the most expensive because they can back it up with service.